Thankfully, not all droids are built tojump over hurdlesand then attack you. 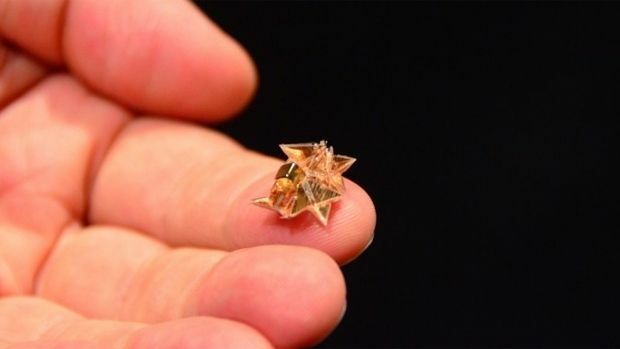 Boffins have now also devised a miniature robot that folds itself, walks, swims and then can destroy itself - which should help stop it from taking over the world. The micro-bot starts life as a square of PVC sandwiched between layers of polystyrene. When placed on a heater, it will fold itself up into an origami shape with a body and legs that can move it. It can make itself in less than a minute. The robot moves thanks to a neodymium magnet within its body. When exposed to an external magnetic field, this magnet oscillates and causes the robot to vibrate with it. As this happens, the legs make contact with the ground causing it to move. Changing the field will steer the robot and make it perform various tasks. Once assembled, the bot can walk, swim and carry stuff twice its own weight. The bot can travel up to 4cm per second. It can then dissolve itself in a small puddle of acetone leaving only the aforementioned small magnet behind. While not entirely practical in its current form, scientists are hoping to shrink the fold-o-bot's size even further (it currently weighs 0.31 grams). They also hope to add sensors and make it move autonomously, with the intention being that it will work inside the human body to carry out surgical procedures. "Such autonomous '4D-printed'robots could be used at unreachable sites, including those encountered in both in vivo and bionic biological treatment," according to a research paper published by the scientists.